Attention Arrest Development fans...if you didn't hear this weekend (then I doubt your true fan status) I will let you know now. 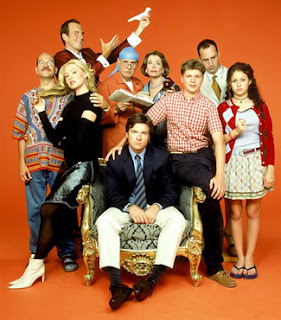 There are plans for Arrested Development to come back to TV for 9 or 10 episodes that will build up to the long awaited AD movie. Now if you have been following this at all in the past couple of years you will know that every couple of months there is a little bit of buzz about an Arrested Development movie. 'This person has said they will do the movie, this person isn't confirming if they will do a movie, and that person is being a douche and probably won't rejoin the cast for a movie' and so-on. It got to the point where I just stopped caring and decided to leave the Bluth's where they would forever be: on the season DVDs. Now that the series creator Mitchell Hurwitz is actually going on record with his plan and series cast members Jason Bateman and Will Arnett have tweeted their excitement people all full on creaming themselves at the possibility of a return. I am not holding my breath, but if it is meant to be, it will be.